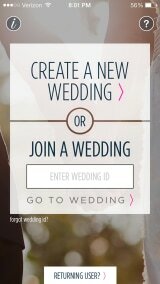 6 Great Wedding Planning Apps! Ah, June. ‘Tis the season for water slides, wine coolers … and weddings. If you’re planning your own nuptials, it’s likely you’ve spent hours on Pinterest scoping out mason jar vases and photos of sparkler exits. Dreaming is fun, but there’s a lot to get done! 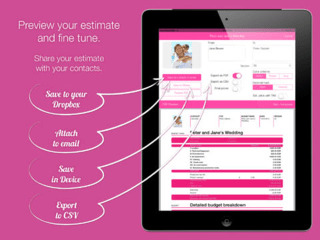 Here are six wedding-planning apps and services that will whittle down your to-do list. Got your list of wedding must-haves, like that 16-piece band and the photobooth with a dozen background options? Great! Now it’s time to face cold, hard reality: Those dreams cost cold, hard cash. Before you set your heart on a mauve ombré cake from a celebrity baker, download the free Wedding Budget Controller app for the iPad to rein it in. The app comes with ready-made templates for weddings from budget to luxe, or you can create your own by adding line items under as many sections as you’d like. The app is also available in Spanish, Japanese, Chinese and Russian, and it supports all major currencies. As you continue to shift your budget, you can save it to Dropbox or your device, export to an Excel-friendly file or email it to your betrothed. Once you — or your budget — have decided how many guests will fête you, it’s time to track down addresses. The online service Postable saves you the time of sending individualized emails to everyone from your old boss to Aunt Millie. 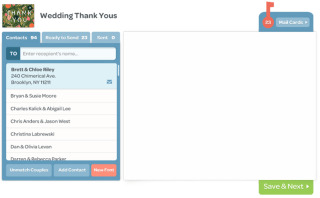 Instead, Postable provides you with a single personalized link that you send to all of your guests. Those lucky invitees fill out the simplest of forms with their name and address — and your secure Postable address book “magically” fills up with their information. From there, you can export contacts to programs like Excel and Gmail to send to a calligrapher, or print mailing labels yourself. Post-wedding bonus: Postable will also print thank-you cards (in a font that looks like handwriting), address and stamp them, and mail them directly to your guests. The cards are $2 each plus postage. 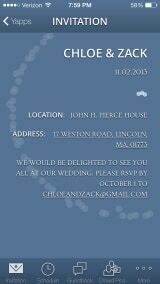 You’ve stuck to your budget, received those RSVPs, and the big day is finally here! Your adoring friends and family won’t be able to stop snapping photos on their phones — and you don’t want all of those pictures to disappear into the social-media ether after last call. WedPics compiles all of your guests’ photos and videos into a central, private location. Couples sign up before the wedding to create a special code for the event. Guests, in turn, use that code to upload their snaps to the app. Everyone who downloads the app and has the code can watch the event page update in real time, or check them out later. After coordinating hundreds of details for the main event, it’s tough to leave any brain space for honeymoon logistics. Shut off your worried mind and let GetPacked tell you how many dresses, suits and sweatshirts to throw in the suitcase. The app makes recommendations based on your answers to simple questions: where you’re going, when you’re heading out, where you’ll stay, etc. You can also create lists of those pesky pre-departure tasks like watering the plants and calling the bank with your travel plans. You’re back from the idyllic honeymoon, reveling in all the extra time on your hands with no wedding to plan. But you’re not quite done yet: It’s time to thank your guests for their generosity and support. Ink Cards makes creating and sending a personalized, physical card extremely easy. Select one of the hundreds of designs, upload a photo, type a personal message — Ink Cards will have the note in your guests’ mailboxes in three to seven days. The cards, which cost $1.99 apiece, have garnered rave reviews from Ink Cards app users. This one is for techy marrieds-to-be and guests only. If you’re not content with a little old wedding website, Yapp will let you create an entire mobile app for the nuptials, which you can invite your guests to download. “If you can type and tap,” the company says, you can do this — no code skills necessary. 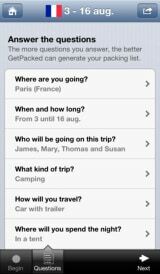 Choose a design template, create pages, upload event information and set the app to private or public. You can even add features like alerts that will pop up on guests’ phones (but please don’t).